Former foreign affairs minister Harry Kalaba says failure to declare a gift by a public office holder is an act of abuse of office. President Edgar Lungu has come under pressure following revelations by the Times of Swaziland that the piece of land said to have been given to him by King Mswati is part of 90 such plots that are owned by Inyatsi Properties Limited, whose subsidiary, Inyatsi Construction in Zambia has been awarded road contracts. 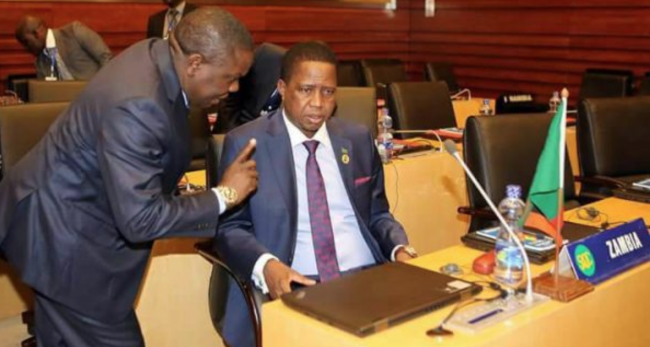 The newspaper reported that the Kingdom of Eswatini is set to become a second home for President Lungu as he is set to build a mansion worth millions at Nkonyeni area. It further reported that the mansion would be built on Lot 225 of Farm Nkonyeni III, which is situated past Sidvokodvo area in the Manzini area and suggested that the plot was possibly not gift from King Mswati. Copies of the architectural drawings, which are already circulating on different social media platforms and online newspapers, reveal that the revisions of the drawings were done in November last year. Chief government spokesperson Dora Siliya told journalists on Monday that President Lungu owned the land in eSwatini, which she claimed was given to him by authorities. She said it was normal for a President to own land in a foreign country. “These are normal practices when the President travels, that various gifts are given in various forms. In this case it was land that was given to the President. This land was processed and given to the President in title,” Siliya told journalists. She said the president was awarded the ‘gift’, which was processed for him by virtue of his status. And State House spokesperson Amos Chanda also told journalists on Thursday that there was no impropriety in the land gift, saying no Zambian money was spent. Swaziland Times, however, reported that the proposed house for the president would cost about US$3.9m. The newspaper wrote that despite the Zambian government alleging that the land was a ‘gift’, documents sourced from the Deeds Registry public information centre reveal that the area in question was one of around 90 plots under the ownership of Inyatsi Properties Limited. And in an interview yesterday, Kalaba, who is Bahati PF member of parliament, said a gift given to any leader was not given to them in their individual capacity. “They can give any leader a gift but that is supposed to be declared to the Zambian people. I know that any gift of over a thousand dollars or K10, 000 should be declared and I want to believe that these are the small things that we should shun as leaders – these are things we should avoid getting entangled into [because] they don’t give confidence to the whole project,” he said.